One of the more distressing items being reported out of the developing medical catastrophe in Haiti is the lack of even rudimentary anesthesia and analgesia for the treatment of amputations and severe acute traumatic injuries.Â One possible strategy for treating patients in pain that is rapidly effective and has little mortality or serious morbidity risk is the use of battlefield acupuncture, a technique pioneered by Air Force Col Richard Niemtzow, MD, PhD in 2001. Because Dr. Niemtzow’s battlefield acupuncture technique is most effective when using specialized small, gold-plated needles that are not always readily available, I have adapted his work to a technique I call battlefield acupressure. But, before I describe these techniques of battlefield acupuncture and battlefield acupressure I must make a nod to the current acupuncture discourse. Despite the fact that acupuncture has been in use for the treatment of pain for 3000 years and there is emerging literature supporting its efficacy, it currently still remains somewhat controversial and it has attracted establishment critics in the medical profession who stridently denounce it. These clinicians point out the lack of compelling, unimpeachable level 1 evidence to support its’ use (as is similar with many other medical treatments practiced today such as the almost entire treatment rational in traumatic brain injury) and cite existing studies concluding the effect of acupuncture is no better than placebo. Some go so far as to deem it as outright quackery. What remains inconvertible, however, is that there is emerging literature supporting its use that is apparently unread and unknown to its naysays. Acupuncture is widely sought by the public and is provided in part by the approximately 10,000 United States physicians who have been trained in CME-approved courses to perform it. There are dedicated CPT codes, it is judged a reimbursable procedure by many insurance companies, and is a health treatment modality that is recognized and licensed by all 50 states. The NIH has declared that it is probably of benefit in treating some conditions. In addition, the use of acupuncture has now been adopted by major academic medical centers such as Harvard University, Johns Hopkins University, Stanford University, UCLA Medical Center, University of Pennsylvania, and the University of Maryland (where it is used in the oncology and trauma units). It is also widely used in the Veterans Administration and throughout the United States Military, where it is now being taught to special operations forces, medics, nurses, and physicians alike for use literally on the battlefield as well as in fixed medical facilities. And, finally, in judging whether this would be an acceptable treatment modality for Haitian patients, what is also irrefutable is the complete absence in many situations of any modern, level 1-evidenced care currently being practiced in Haiti. As an example, some practitioners report being forced to amputate limbs on awake patients placed on bare wood tables under dirty bedsheets (i.e., Civil War era medicine), hardly the definition of level 1, evidenced-based care. In this situation, perhaps the lack of a wide body of level 1 evidence for acupuncture use and the ongoing sometimes vitriolic charges about its’ efficacy is a nicety that the medical community and Haiti can not now afford. In other words, to boil it down to surgeonspeak – it may work, likely won’t hurt, but maybe you gotta try something because patients are getting their legs cut off without narcotics or anesthesia. 1. As delineateed by functional MRI studies, for many people, pain signals in the body as processed by the brain seem to somehow interact with specific points on one or both of the earlobes. 2. In these patients, there are 5 main points that can be stimulated through needles or pressure on each earlobe that will partly or totally block this reflex, thus diminishing or eliminating patients awareness/experience of pain. 3. These points vary slightly in people but are close to the positions numbered in the photo below. 4. Stimulation of the points should be done sequentially as numbered below on each ear lobe. That is, point 1 on each earlobe is stimulated, then points 2 on each ear lobe, etc. (not 1-5 on one lobe, then 1-5 on the other lobe. 5. Pain control often begins within seconds after point 1 on each ear is manipulated and very likely will occur after the first two points on each ear are stimulated. 6. Stimulation is best done by using small, gold-plated, self-retaining needles that remain in place for a day or so and are left to fall out on their own. 7. Because these gold-plated needles are almost certainly not available in Haiti, conventional open-bore IV/venopuncture needles can be used – the smaller the better. 8. There are two possible techniques to stimulate the points if conventional medical needles are used. 9. Perferred method – the needles should puncture the epidermis, inserted approximately 1 mm and then left in place. Because they are not self-retaining they may fall out when the patient moves. 10. Alternately, the points can be manipulated using the 1-1, 2-2, etc. placement protocol by placing the needle 1 mm into the tissue and rapidly moving it in and out in the tissue without completely withdrawing it as in a “pecking” type motion. This should be done for 2-3 minutes at each point. 11. After both point 1’s have been stimulated, the patient should walk briskly about 15 paces away and then back towards the practitioner. By some unknown mechanism, this contributes an additive effect to the pain control by needle stimulation. 12. The patient should be queried after each point stimulation as to whether pain is diminishing. If stimulation of points 1-3 does not diminish pain, the procedure should be retried with slightly offset points from the ones listed below. 13. The effect of stimulating these points can cause a partial diminition in pain for hours to days after the treatment. 14. This is a commonsense adaption of the Niemtzow (needle requiring technique) described above. I have used it to great affect in situations where needles were not readily available. It is free, can be done in seconds, and has no significant risk for the patient associated with it. 15. It is known to all acupuncturists that stimulation of acupuncture points by pressure or heat can have profound physiological effects in some patients. 16. The points listed below can be readily stimulated to produce effective pain control in many patients by direct, sharp pressure on the point without piercing the skin. 17. Using a sharp tipped object such as a fingernail, tip of a ballpoint pen, sharped-pointed small stone, or even a wood splinter the corresponding points on both ear lobes should be simultaneously manipulated by placing and holding firm pressure on the points. 18. For instance, the practitioner stands behind the bed of the patient and uses the edge of their forefinger fingernails on point one and gives very firm pressure for 30 seconds. If this produces good pain control, very firm pressure is held for several minutes. 21. If pain control continues, the practitioner then simultaneously places firm pressure on points 2 and so. 22. Because it is clumsy to ambulate the patient while keeping external pressure on these points, the patient can remain seated or in bed and instead can pump their legs as in a bicycle motion to potentiate the pain control effect of the acupressure. 23. If any degree of pain control is achieved by acupressure of points 1 and the bicycle motion, the patient should be shown how to self-administer this technique by using their fingernails to stimulate points 1, simultaneously if possible. 24. Anecdotally, it is believed that a slowly accruing analgesia effect may occur with repeated acupressure ear treatments. Battlefield or Hatian setting acupuncture, pure and simple, is quackery. Where do these “physicians” get these ideas? Thank you for publishing this…this is the beauty of our medicine. And what a perspective you bring to shed some light on this for all of us practitioners that don’t see acupuncture in such intense situations! It’s really disturbing to learn the Air Force is training physicians in “battlefield acupuncture.” There is no good research showing acupuncture can deal with the severe pain of burns or having a limb blown off. Treating personnel in the field with acupuncture takes vital time away from life-saving treatments. It can delay providing effective pain relief necessary to keep shock from developing. Outside the military, this would be called substandard care and malpractice, especially as the wounded in the field have no opportunity to give informed consent. We owe our wounded the best that science can deliver. They deserve real pain relief, not voodoo pin sticking that only suggests that they feel no pain. I would imagine my father would feel the same about Americans giving the unfortunate Haitians acupuncture. Thanks so much for this article on battlefield acupuncture. As I have been watching the news about Haiti I realized what a befefit to the people of Haiti acupuncture would be. In my practice as a Licensed Acupuncturist I witness daily the pain relief people experience. I find it unfortunate that people who have not experienced this find it necessary to down play the good results and even accuse us of quakery. Some of the responses here demonstrate the detrimental effects of this turf war. As stated in the article the people of Haiti are suffering amputations with little or no pain medication or anastheia. Why would anyone deny another person pain relief just because they don’t understand how it works? There is no reason acupuncture woud get in the way or replace any other medicine or therapy. It is often used in conjunction with standard medicine. Now is a time to put our differences aside and do everything humanly posible to help alleviate the pain and (sometimes unnecessary) suffering of the Haitian people. Would be so helpful if we could train all the medical personnel in the ear acupuncture/ acupressure before deployment. Not only could it help the people with pain and acute stress but could be a welcomed modality to administer to other relief workers for their own relaxation. So if I chop off my earlobes I’ll never feel any more pain? Or do they leave a magic earlobe resonance after they’ve been removed? This is pure, unadulterated quackery. Time and again well-designed, blinded studies have shown that the effects of acupuncture and acupressure are nothing more than the placebo effect in action. How much more evidence of lack of efficacy is necessary before we consign these “modalities” to the dustbin of history alongside humoral theory and phrenology. It is well past time for our medical professionals to reject magical thinking and discredited modalities. We owe our patients the very highest level of critical thinking, unclouded rationalism and scientific rigor when assessing possible approaches to care. Acupuncture and acupressure clearly fail to meet that standard. No. There is quite simply no anatomical evidence to support this at all. If this were the case, then everything we know about pain signaling by physiological and anatomical studies would be overthrown. There just is no interfacing with peripheral tissues onto the earlobes, period. 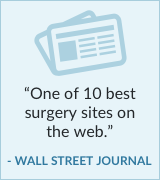 It’s a shame that one of (formerly) top surgery blogs according to the WSJ is guilty of something so plainly inaccurate. Placebo effect in action? Then perhaps you can explain why acupuncture works so well with animals. I have seen it work wonders in veterinary medicine. I am a an acupuncturist specialized only in Auriculo medicine and to me, you are doing a good job! This science is in its babyhood and following the rules of the classes will not help the emergency situations. Keep on your good work. You have a chance of your life to go beyond the basic principles for the good of the people and not for thre paper and your titles. degree burns right quick. Within a couple of months his battalion had become believers. Fortune smiled on them. A Chinese-American guy in the battalion had family connections that obtained both products in bulk forthem. sent contained an edited version of the article and 1000 auricular tacks. small pool of points for field use. Makes sense to me. No matter the conditions or environment the ears are almost always easily accessed. Having been stove-up in the woods, I can personally attest to the fact that partial pain relief can make the difference between continuing down the path and being unable to. I’ve taught many, many women to press on a point on the low abdomen to relieve menstrual pain. As soon as the pressure is removed the pain returns. But it’s easy to press the point and in public through clothing. If that gets the patient through the day until obtaining Midol then it did the job. Proven efficacy this little trick may not have but it certainly has great utility. I’m a pain and neurological anomaly specialist. I practiced in a hospital for seven years. Several months after I started the docs began to take a real interest in acupuncture and Chinese medicine. We began interweaving allopathic and oriepathic medicine because it worked. Knowing how something works is not always necessary to make use of it. If a physicist gave an honest answer to “What is the nature of electricity? Why does it do what it does?” s/he would say that is unknown. But there we can describe it’s behavior; quantify that behavior, and infer and induce extremely reliable formulas for predicting it’s behavior. There are 80000 volumes of professional literature in the largest traditional medicine library in Beijing. None of them gets any farther in describing chi than our physicist did with electricity. I can’t tell you how acupuncture works but I can tell you that a 2800 year body of observational data, results, and experimentation has produced principles with 1:1 reproducibilty within a population. And those are the principles that drive my practice. I’ve read and listened to interesting ideas backed with poor reasoning and premature conclusions about chi. Some say chi a magnetic field, others say electricity, other say that fascia has a second function as a circulatory system, others thought that stimulation of endorphins was the intervention factor. Any single-factor theory is grossly simplistic in my view. Consider how many systems are activated by the simple act of piercing the skin with metal; nervous systems, endocrine system, cardio-vasular system and the immune system. Once you delve into the medicine you’ll find something (many things) that must be investigated deeply. One laast thought. Naysayers most often attempt to refute the efficacy of acupuncture on the basis of prima facie absurdum arguments and the lack of evidence for efficacy. When analyzed, the first is seen to mere opinion. And the second…well, if all you know is what somebody else measured, you don’t know much. I was trained to do battlefield acupuncture at VA and it is highly effective. I have had it done on myself for chronic back pain resulting from a spinal tumor. It is not placebo. It has allowed me to sleep and resume many activities after six years of misery and failing all conventional medical regimens for chronic pain. Not being able to understand the physiology behind it does not make it quackery. All physicians managing patients with chronic pain should receive training or at least be open to refer patients to someone trained in BFA.